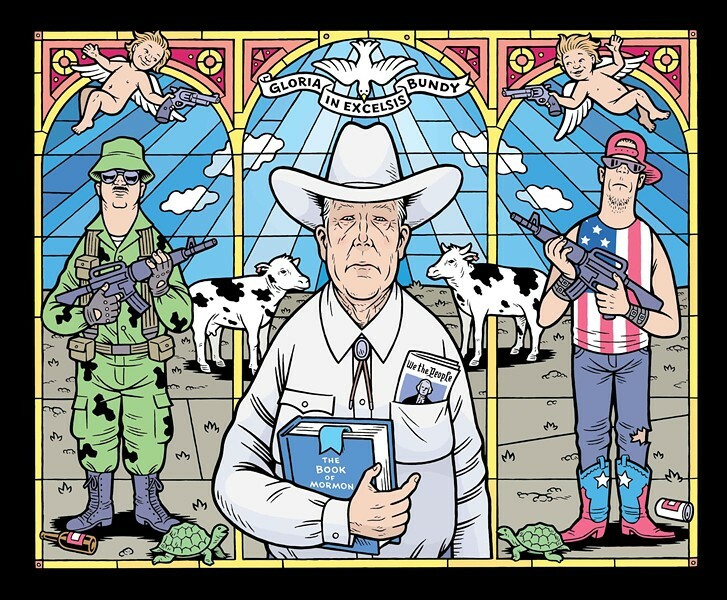 BURNS, Ore.—In two heavily armed, militia-backed confrontations with the federal government in 2014 and 2016, Nevada scofflaw rancher Cliven Bundy and his family successfully created a self-serving narrative of a God-fearing, hard-working, true-blooded American family fearlessly battling an overreaching, oppressive and unconstitutional federal bureaucracy. Bundy, 71, became a national figure in April 2014 when he forced federal land managers to release cattle seized for trespassing on public lands in southeast Nevada. Nineteen months later two of Bundy's sons, Ammon and Ryan, led an armed group that seized Malheur National Wildlife Refuge, about 32 miles south of this remote ranching community in southeast Oregon. In both instances, the elder Bundy leveraged growing public dissatisfaction with the federal government to promote his assertion that federal tyranny is crushing individual rights. Their David vs. Goliath story line, blown out across three years of high-profile media coverage, attracted support from the far-right militia groups proliferating and itching for a fight during the latter years of the Obama administration, as well as from conservative politicians financed by extractive industries seeking to turn over ownership of hundreds of millions of acres of federal public land to the states and private entities. The rhetoric of an overreaching federal government has given legal cover to the Bundy family and its supporters. The success of this propaganda campaign was underscored by the unexpected October 2016 acquittal of Ammon and Ryan Bundy and five others on federal conspiracy and weapons charges in connection with the 41-day militia takeover of the Oregon wildlife refuge. The "heroic" framing embodied by that legal win is currently being put to test in a Las Vegas federal court. Cliven Bundy and his two sons, along with militia leader Ryan Payne, are charged with conspiring to thwart the 2014 government roundup of cattle near the town of Bunkerville, Nev., after Bundy refused to pay more than $1 million in delinquent grazing fees dating back 20 years. The four men each face 22 felony charges, including counts of conspiracy against and assault on federal officers. In that incident, Cliven Bundy, backed by militia members, forced National Park Service and U.S. Bureau of Land Management employees to release the cattle under the threat of violence. Hailed by Bundy supporters as the Battle of Bunkerville, the incident is considered a major victory in the far-right populist effort to wrest control of public lands from the federal government. The flashpoint has had far-ranging effects. "They basically concluded that you can point guns at the federal government and the government will back down with no consequences," says University of Oregon geography professor Peter Walker, who studies the social and political environmental aspects of the American West. In Burns, a ranching town of 5,000 that serves as the Harney County seat, there is a far different and much-darker and terrifying narrative of the Bundy family and their militia allies that is emerging in the aftermath of the armed occupation of the community. Ammon Bundy aligned with a coalition of militia groups and tried to use heavily armed men to intimidate community leaders into supporting their call to reject federal authority over the county, says recently retired Harney County Judge Steve Grasty. But community leaders and local ranchers refused to join their cause. Harney County Sheriff David Ward deftly avoided a violent confrontation that the Bundys were trying to provoke during three months of heavy militia presence in Burns. "Ammon Bundy genuinely thought he was going to be able to lead a national revolution," Walker says during an interview in his office in Eugene, Ore. "He didn't do his homework. He came to the wrong place." That's because Harney County ranchers and federal land-use managers have a long history of collaborating on land-use and water issues at the Malheur National Wildlife Refuge and Malheur National Forest, spearheaded by the High Desert Partnership, a nonprofit that successfully bridges the often formidable gap between environmentalists, ranchers and the federal land managers. Harney County ranchers refused to join Ammon and Ryan Bundy in their call to ranchers across the West to tear up their federal grazing permits. The reality of the Bundy/militia confrontation in Burns reveals a narrative that's very different from their finely honed, folksy image of salt-of-the-earth ranchers protecting forgotten men and women from rampant federal abuses. It wasn't the federal government that was overreaching and abridging the rights of citizens. Rather, it was Bundy fanaticism that put innocent lives at risk, Ward says. "They are extremists," says Ward, who was hailed by Grasty for exercising patience and restraint in the extremely volatile crises that overwhelmed this quiet community. "Any disagreement with them makes you the enemy." Throughout the Malheur occupation, militias continued to menace Burns, leaving many terrified that a bloodbath was an errant firecracker away. "This was day after day after day after day," Grasty says during a lengthy interview in his home about 10 miles north of Burns where his anger steadily built the longer he talked about what happened. "It was hurtful to your mind. How do you set that aside? That to me is what was hurtful." Asked if his community was subjected to an ongoing act of terrorism by the Bundys and their militia allies, Grasty pauses for a moment and looks off into the distance. "Yep. If they can fragment [you]," he says, before pausing again. "It's a horrible weapon." Experts and witnesses say the roots of the Bundy family's uncompromising and authoritarian approach over the use of America's public lands can be traced to their belief in the historic Mormon entitlement to the promised land of Zion and their fringe interpretation of the U.S. Constitution first posed by a far-right Mormon writer. "It all comes back to religion," says Walker, who is writing a book on the Bundy-led occupation of Malheur and Burns. Academic research on Mormon history, theology and the Mormon migration to the Great Basin to create what the early western settlers called the promised land of Zion in the mid-19th century provides a framework for understanding the Bundy family's refusal to accept federal authority over public lands. The militia-supported Bundy aggressions in Bunkerville, Burns and Malheur—while often not Mormon themselves—can be traced to early Mormon religious and political beliefs that have contributed to modern-day right-wing extremism, says Betsy Gaines Quammen, a professor of world religions and culture at the Yellowstone Theological Institute, whose 2017 doctoral dissertation at Montana State University was titled "American Zion: Mormon Perspectives on Landscape, from Zion National Park to the Bundy Family War." "I can tell you with great confidence that Zion is part of this public-land issue and that the militia has been part of the Mormon world view since the very beginning," Quammen says. The roots date back to long before the Civil War. After the 1844 murder of Mormon founder Joseph Smith by a mob in Carthage, Ill., his successor, Brigham Young, led the faithful to Salt Lake Valley in 1847. There they would establish Zion in the Great Basin that encompassed most of present-day Utah and Nevada. In Mormon doctrine, Zion refers to the place where people "pure of heart" will live together. Also known as the New Jerusalem, Zion is supposed to be built on the American continent, with Independence, Mo., identified as the specific location. But conflict in Missouri and Illinois, along with divine inspiration, led Brigham Young to move the Mormons to the Salt Lake Valley. Young declared the valley area "a first-rate place to raise Saints." Furthermore, he insisted that if they lived worthily, the Lord would never allow them to be driven from the promised land, according to a July 1988 article in the Ensign, a church publication. Prior to their exodus West, Mormons had already created the largest militia in the United States: the Nauvoo Legion. Only the U.S. Army had more forces. Initially, Zion was centered in Salt Lake Valley, but it soon grew to encompass far more land. The Mormon land claims expanded under Brigham Young's theocracy when he created a provisional state in 1849 called Deseret, stretching from Oregon to Arizona. This proposed mega-state was never accepted by the federal government, which created the territory of Utah in 1850 encompassing only part of the proposed Deseret. Utah was granted statehood with its present boundaries in 1896. Thomas Murphy, chairman of the anthropology department at Edmonds Community College in Lynnwod, Wash., says Young declared Mormons had a divine right to claim the land. The right still resonates. "You see that claim of divine right echoed with the Bundys," he says during an interview in his office. Murphy, who was once threatened with excommunication from the Mormon church for his research on the genetics of Native Americans that debunked the Mormon belief that natives are descendants of ancient Israelites, says the Bundy family appears to believe they are fulfilling God's commands. 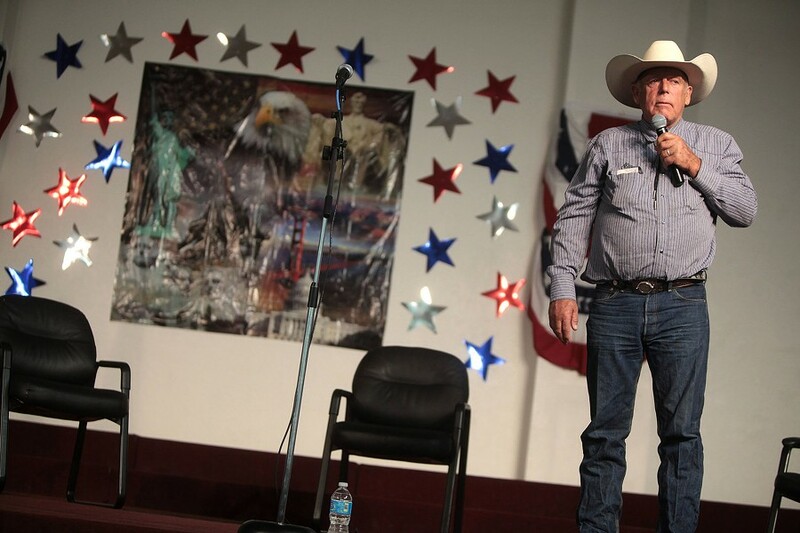 "You see a righteous fury in the Bundy family, a sense that God is on their side," he says. The Mormon historic claim of Zion bestowed upon the faithful by God now includes hundreds of millions of acres of public land controlled by the federal government, Quammen says. Bunkerville, Burns and Malheur fall within either the boundaries of the historic Mormon provisional state of Deseret or the spiritual lands of Zion. The tension between religious claims to a promised land and the legal and constitutional federal right of ownership of the same land can create conflict, especially when the Mormon affiliation with militias is added to the mix, Quammen says. The Church of Jesus Christ of Latter-day Saints (the official name of the Mormon church) has taken a two-pronged approach with the Bundys. On one hand, it publicly repudiated the Malheur refuge takeover after the Bundys and others repeatedly referred to Mormon scripture and inspiration from God as part of their justification for seizing the federal property. Ammon Bundy explained his God-inspired reasoning for coming to Harney County and requested other like-minded individuals to come to Harney County to challenge the federal government in a Jan. 1, 2016 video, the day before he led the takeover of the refuge. "While the disagreement occurring in Oregon about the use of federal lands is not a Church matter, Church leaders strongly condemn the armed seizure of the facility and are deeply troubled by the reports that those who have seized the facility suggest that they are doing so based on scriptural principles. This armed occupation can in no way be justified on a scriptural basis. We are privileged to live in a nation where conflicts with government or private groups can—and should—be settled using peaceful means, according to the laws of the land." Mormon leaders, however, have not taken any public steps to excommunicate the Bundys from the church. Cliven Bundy told The Salt Lake Tribune that he "has never had a problem with the bishop," referring to his local religious leader. Excommunications are usually matters handled at the local level. Murphy, who has firsthand experience in the Mormon excommunication process, says Mormon leaders do not want to cause a split in the church by excommunicating the Bundy family. "They fear they would lose a lot of local membership," he says. "A lot of Mormons would be relieved because this is embarrassing. But a lot of Mormons might stand with the Bundys." Quammen says the arduous trek across the country by Mormon pioneers fleeing Nauvoo, Ill., after Smith's murder and the failure of the federal government to protect Mormons from earlier violent persecution in Ohio, Missouri and Illinois left two long-lasting beliefs when they arrived in the Great Basin. "This was their Zion and they were going to do anything they could to protect it," she says. "And, I would add, in addition to that they also landed there with a lot of hatred against the government." Cliven Bundy claims his ancestors started grazing cattle in the late 19th century on desert in southeast Nevada near the Virgin River, just downstream from St. George, Utah, which was an early Mormon settlement in a region called Dixie. Quammen had an opportunity to visit the family's ranch where she interviewed Cliven, Ammon and Ryan. A devout Mormon, Cliven Bundy has 14 children. Some Mormons, like the Bundys, continue to believe the lands within Zion are sacred and rightfully controlled by the descendants of the first Mormon pioneer families that put the land to "beneficial use" through grazing, Quammen says. "That was one of the first things that Cliven said to me," Quammen points out. "The first Mormons were here and they had their horse and the horse takes a bite of grass and the moment they take a bite of grass, that's the first beneficial use." "So now we have created them [rights] and we use them, make beneficial use of them, and then we protect them. And that's sort of a natural law, and that's what the rancher has done. That's how he has his rights. And that's what the range war, the Bundy war, is all about right now, it's really protecting those three things: our life, liberty and our property." Bundy's claim that his rights to the land are established by creating "beneficial use" of the property through animal grazing is unsupported by federal law or Supreme Court rulings. He appears to be conflating Western water rights that are based, in part, on the seniority of the first person to put water to "beneficial use" establishing rights to the water. Cliven Bundy's claim to property also ignores that fact that nearly all the land he was grazing his cattle on has been owned by the U.S. since it was ceded from Mexico in 1848 as part of the Treaty of Guadalupe Hidalgo that ended the Mexican-American War. The land originally belonged to the Paiute tribes. Bundy only has title to 160 acres. Despite Bundy's claim that his family had been grazing cattle in the area since the late 19th century, there's no official record showing his family had legal title to land prior to 1948. Clark County Recorder documents posted by KLAS-TV show the 160-acre Bunkerville ranch Bundy calls home was purchased by his parents, David and Bodel Bundy, from Raoul and Ruth Leavitt on Jan. 5, 1948. The purchase included the transfer to the Bundys of certain water rights, including water from the nearby Virgin River. 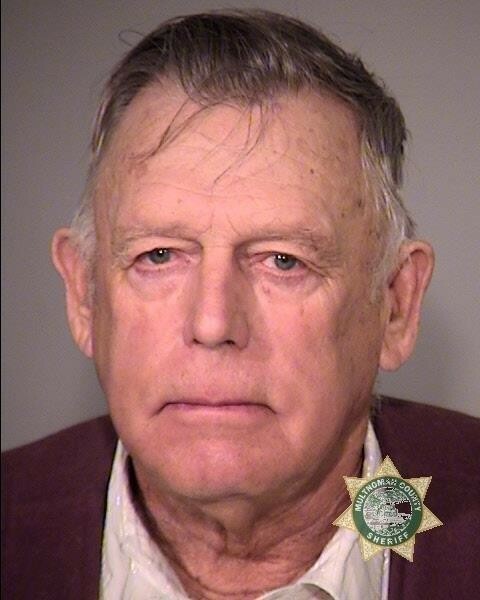 Cliven Bundy was born in 1946. 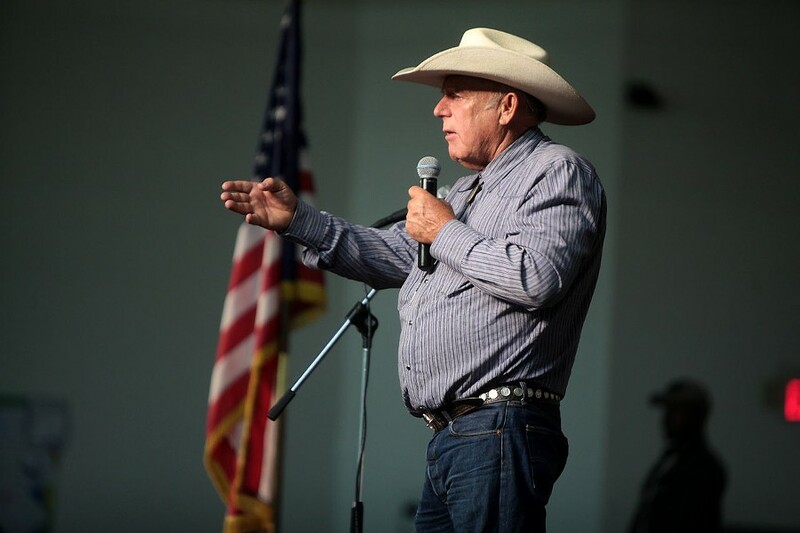 Beyond that, the elder Bundy also accepted federal jurisdiction over the public grazing lands for decades and paid grazing fees on his Bunkerville federal allotment from 1973 through 1993. He ceased paying the fees after the Bureau of Land Management reduced the size of his allotment and the number of cattle that could be legally grazed in order to protect the endangered Mojave desert tortoise. The bureau canceled his grazing permit in 1994, but Bundy continued to trespass his cattle on more than 1,200 square miles of Bureau and National Park Service land at the Lake Mead National Recreation Area. The ongoing encroachment led to the roundup of Bundy's cattle that culminated with the armed standoff between Bundy, his militia supporters and federal law enforcement. In addition to the Mormon doctrine of divine right to the land, the Bundys have also embraced the teachings of a far-right, anti-communist Mormon conspiracy theorist named W. Cleon Skousen, who died in 2006. The Bundys and their militia supporters frequently carried copies of Skousen's annotated, pocket-sized, old-English version of the U.S. Constitution published by a conservative organization called the National Center for Constitutional Studies during the Bunkerville, Malheur and Burns occupations, turning to it to justify their actions. Cliven Bundy even offers constitutional lessons via YouTube that are heavily tainted by Skousen's beliefs. According to his obituary, Skousen worked for the FBI for 16 years under J. Edgar Hoover, taught a popular class at Brigham Young University, and published 46 books, including The Naked Communist, which has sold more than a million copies since 1958. Ironically, Skousen attracted considerable attention from the FBI for his extreme views and logged a 2,000-page file on his activities, including accusing President Dwight D. Eisenhower of being a Soviet agent. He also campaigned to eliminate the federal income tax, wanted to convert Social Security system to private retirement accounts, and opposed all federal regulatory agencies, including the Occupational Safety and Health Administration and the Environmental Protection Agency. He also wanted to repeal the minimum wage, eliminate unions, nullify anti-discrimination laws, remove barriers separating church and state and sell off the public lands and national parks. Skousen's controversial political theories serve as an intellectual bridge among the Bundys' Old West Mormonism, the far-right wing militias and the American lands movement's efforts to transfer federal lands to local governments and private interests. The connection goes back decades. The National Center for Constitutional Studies, which has published 15 million copies of the Skousen-annotated Constitution, was founded by Skousen and later taken over by Utah businessman Bert Smith, who played a leading role in the first Sagebrush Rebellion in the 1970s, according to a 2016 profile in E&E News. Smith also donated $35,000 to help found the American Lands Council, an organization dedicated to facilitating the transfer of federal lands to the states, in 2012. American Lands Council is also funded by the Koch Brothers and taxpayer money allocated by county commissions, High Country News reported in a May 2015 exposé. "Smith's influence in inciting these western anti-public lands and rancher revolts, particularly in Utah, cannot be overstated," wrote Chris Zinda, a New Harmony, Utah, activist who monitors state and federal land issues for the St. George, Utah-based Independent. 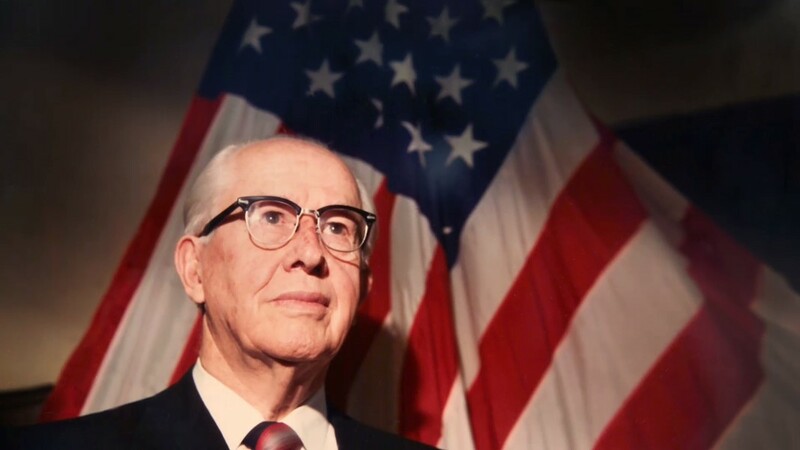 Another major Bundy influence is former Mormon church President Ezra Taft Benson, who also served in President Eisenhower's cabinet as secretary of agriculture. As Matthew Bowman, the author of The Mormon People: The Making of an American Faith, wrote in a January 2016 column in Time Magazine: "Benson adopted an important Mormon concept of 'free agency,' which maintains all human beings are free to choose from right and wrong, and that the purpose of our lives on earth is to cultivate our moral insight and ability to choose good." Benson, Bowman wrote, was one of the first to write that large government restricts free agency. "He and the Bundys after him believe that government is not merely inefficient, but an inherent moral hazard," he wrote. The Bundys' constitutional interpretations take a simplistic, literal reading of the Constitution and often ignore a body of Supreme Court decisions that run contrary to their arguments, particularly in regard to whether the federal government has a right to own vast tracts of land. "These folks are very constitutional based, but only on the part of the Constitution that they like," says Sheriff Ward, who had "eight to 10" hours of often tense conversations with Ammon Bundy on the Constitution and the role of federal government and religion. Ward says when he attempted to explain his views on the Constitution and religion, Ammon Bundy would get angry. Bundy, Ward says, continued to pressure him to "change my stance" and made "quite a few threats" that were generally "vague." This was just a prelude to a deluge of emailed death threats from anonymous email accounts. Some threatened Ward with hanging if he didn't knuckle under, he says. "There were blatant death threats that I forwarded to the FBI," he says. Walker, the University of Oregon professor, is convinced Ammon Bundy's constitutional philosophy is traced to Skousen. "When you listen to Ammon Bundy talk about the Constitution, it's almost word-for-word from stuff Skousen had written," he says. And while Benson was wary of big government, he also served in the federal government at the highest level as a cabinet secretary. Cliven Bundy has taken Benson's cautious view of big government much further. "Bundy basically says he does not believe in the federal government. It just doesn't exist," Quammen says. "He believes in the county. He believes in the sheriff. He believes in 'we the people.' But he doesn't believe in the federal government." Cliven Bundy repeatedly told land managers with the Bureau of Land Management that any effort to remove his cattle from public lands would be met with force. His threat continued a history of violent conflict between Mormons and non-Mormons and at times between Mormons and the federal government. The United States nearly went to war with the Mormons in 1858 in the so-called "Utah War." Smithsonian Magazine writer David Roberts provides a comprehensive overview of the events leading up to the conflict in a June 2008 feature story on the 150th anniversary of the little-known conflict. "The Utah War culminated a decade of rising hostility between Mormons and the federal government over issues ranging from governance and land ownership to plural marriage and Indian affairs, during which both Mormons and non-Mormons endured violence and privation," Roberts wrote. Armed conflict was averted when Mormon church President and Utah Territorial Governor Young agreed to allow the federal government to appoint a non-Mormon as governor. The year before the Utah War, the most notorious clash between a Mormon militia and non-Mormons occurred in southern Utah when a militia brutally murdered 120 Arkansas men, women and children at the Mountain Meadows Massacre. They were executed after being convinced to surrender their guns. The church tried to cover up its association with the murders for nearly 150 years, blaming it instead on a Native American tribe. In 2007 the Church of Jesus Christ of Latter-day Saints officially blamed local church leaders in Cedar City, Utah, for the September 1857 massacre and stated that then-church President Young sent a message not to harm the emigrants, but it arrived too late. Some historians theorize Young ordered the attack, but they acknowledge there is no proof. Richard Turley, assistant historian of the church and co-author of Massacre at Mountain Meadows, told National Public Radio in a 2008 interview that the slaughter of the unarmed men, women and children, some of whom were begging for their lives when they were killed, shows how quickly atrocities can unfold. "These people who carried out the massacre were in many ways ordinary ... individuals who got caught up in emotion, caught up in the circumstances of their times and began to make decisions that led to committing an atrocity," Turley said. "And what was disturbing about that was the realization that the difference between ordinary people like us and these people who committed atrocity was really a short distance." At the time of the massacre, church leaders feared the federal government planned to take control of the Mormon-controlled territory and stamp out the widespread Mormon practice of polygamy. Mormon leaders warned that the incoming settlers traveling on the Arkansas wagon train could be working with the army in the days leading up to the massacre. Overt violent conflict between the Mormon church and federal authorities has largely been supplanted by a struggle over control of public lands. The federal government owns 65 percent of the land in Utah. The Utah Legislature remains dominated by Mormons (88 percent) and is supporting the transfer of federal land to state control. The Legislature passed the Transfer of Public Lands Act and Related Study in 2012, seeking to force the federal government to turn over much of its public lands to the state. At the federal level, Sen. Orrin Hatch and Congressman Rob Bishop, both Mormons, have sponsored federal legislation to turn over public lands to the state. Murphy, the Edmonds Community College professor, says federal land ownership in Utah is a source of significant conflict because it's a tangible reminder of the federal government's role in ending Brigham Young's theocracy and eventually forcing the church to renounce polygamy in 1890. "It is the federal government through its control of public lands that is still preventing Mormons from realizing this vision," he says. More than 160 years after the Mountain Meadows Massacre, and after decades of resentment toward federal control of public lands, Cliven Bundy first clashed with the federal government at Bunkerville. Guided by religious inspiration and a Skousen-influenced constitutional claim to the land, Cliven Bundy whipped up fear of an oppressive federal government to rally a militia to his Nevada ranch. Militia members pointed high-powered rifles at federal employees attempting to execute a court order authorizing the removal of Bundy's cattle from federal land. The margin for a mistake that could have triggered bloodshed was razor thin. Shortly after the federal government released the cattle and withdrew from the area, Ammon Bundy acknowledged that the militia was used to instill fear in the federal employees. "We did have militia and weapons, and that was important because [the federal officers] didn't know whether or not we were going to fire on them," Ammon Bundy says in a video that was presented as evidence by federal prosecutors in a case against Bunkerville defendant Scott Drexler, who pleaded guilty to a misdemeanor charge last month. While many in Burns are trying to put the Bundy/militia occupation behind them, community leaders, including former county judge Steve Grasty and Sheriff Dave Ward, are hoping that justice is finally served in Las Vegas. And by justice, they mean that the Bundys and their supporters should be held accountable for their actions during the Bunkerville standoff. Ward says he "was very disappointed" after Ammon and Ryan Bundy and five others were acquitted in federal court for their role in the Malheur National Wildlife Refuge takeover. He worries that if they're acquitted again, it would send a dangerous signal to them and their supporters, including the militias, that "there is even less accountability than they thought there was at the beginning." Grasty is still bitter over the trauma inflicted on his community by the Bundys and their supporters. "I have a hard spot in my heart for Ammon Bundy and his friends," he says. The importance of the Las Vegas trial cannot be understated, he adds. "If they are found guilty, the system has run its course, and it does put others on notice that this model is not a good model to follow," Grasty says. "There has to be a better model to follow. Armed insurrection isn't the way to do it." UPDATE Jan. 8: Less than a month after U.S. District Judge Gloria Navarro declared a mistrial, Bundy & Co.'s case was dismissed.